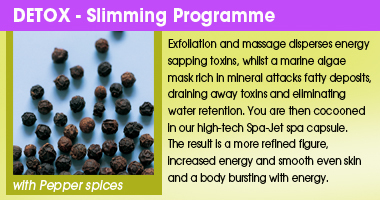 Discover and enjoy an incredible way of being through your choice of four body wrap programmes. 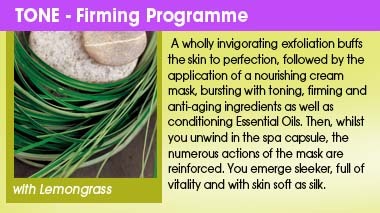 Each Aroma Mosaic programme includes the benefits of our multi-sensory spa capsule to enhance your body wrap experience. Enjoy your relaxing back and shoulders massage with our essential oil balm to relax muscles and help ease tensions. Sun exposure, weight loss and breast feeding can all take their toll on this most fragile and vulnerable area, accelerating the ageing process. This intensive firming treatment incorporates specialised products to stimulate cell renewal and a sculptural mask to strengthen and restructure collagen fibres enabling the skin to regain its firmness and elasticity, reducing stretch marks and producing an impressive anti-ageing appearance. Intensive scrub with essential oils, sea salts and floral petal scrub are exfoliated into your skin and removed in a shower and finished with a body hydrating moisturiser. A total body massage using a sensual blend of oriental spices infused with Balinese Stones in a hot aromatic granita with marula oil. 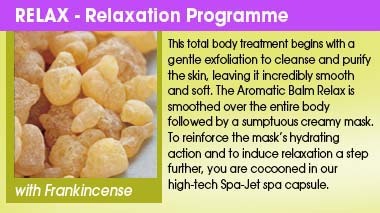 This will transport you to a renewed sense of relaxation and well-being, reduce muscular tensions, relives stress, eliminate toxins and harmonise body energy. This treatment helps to detoxify congestion and acne prone skin, including the extraction of impurities which is then followed by a purifying mask to control oil and reduce further breakouts. • The breakthrough concept of Hydrofusion­, the combination of steam and infrared heat, to enhance deep detoxification and better penetration of cosmetic active ingredients. Let our expert therapist gently exfoliates your hands, enjoys a massage using a blend of essential oils to treat pigmentation, soften and condition your hands and nails. We apply a luxurious mask to hydrate and soften the skin, followed by an infused hand wrapp. Finally finished with an application of warm healing paraffin. Sit back, enjoy a relaxing foot soak in floral petals and essential oils, followed by an exfoliation and hydrating mask up to the knee, encouraging circulation, and soothing tired feet. 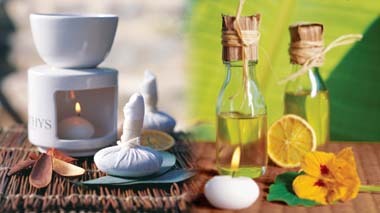 With a deeply relaxing aroma therapy massage incorporating reflexology points and including an infused leg wrapp.